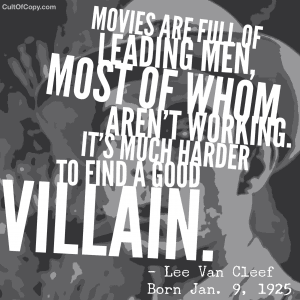 “Movies are full of leading men, most of whom aren't working. 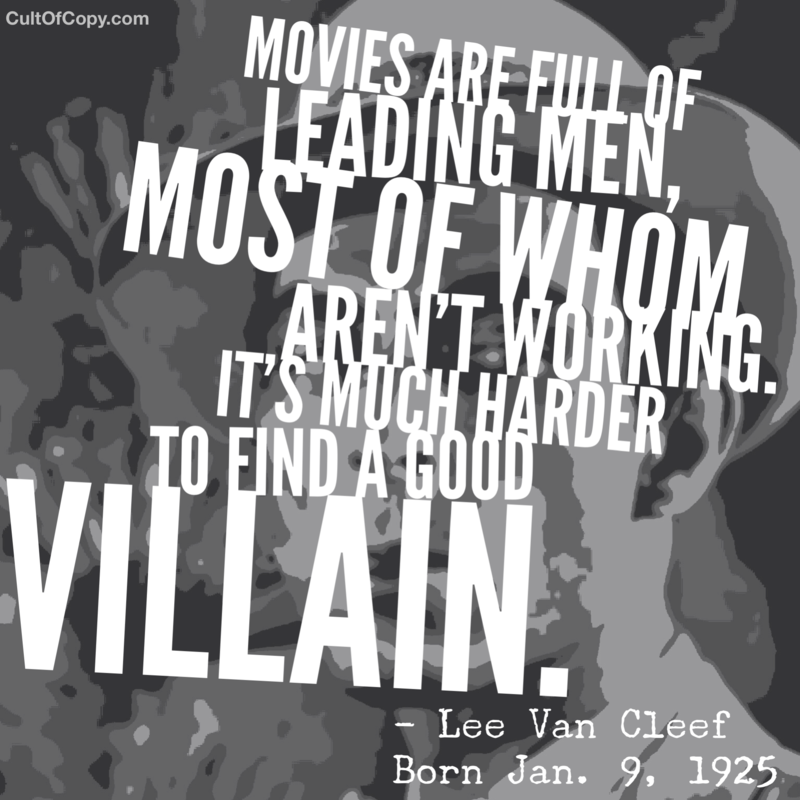 It's much harder to find a good villain.” – Lee Van Cleef, Born Jan. 9, 1925. The secret of creating a powerful persona in your marketplace is to help your prospects find good villains to add a little adversarial psychological opposition to their lives. They don't need another self-serving “good guy” – or at least they aren't into that pitch for your services and products. But give them a villain that is actively trying to thwart and challenge them, and suddenly their life has a dramatic conflict. They are part of a story. They are striving for something and AGAINST something, too. That extra push can make all the difference. Of course, as you grow an audience around creating villains and conflict in the minds of your followers and fans, you may well become the villain yourself – scourge of your shared enemies. That's obviously great for positioning, too. The enemy of my enemy is my friend, as they say. Occupy the role with gusto. Revel in frustrating the plans and plots of your villainous creations and share those adventures with people you would have see you as a hero. Someone's got to do something, even if it's just little old you. For great wonderful examples of this method being applied profitably each and every day, I recommend political and news talk radio. Note particularly how the advertisements and endorsements intersect with the “villains” that the host unceasingly and valiantly rails against on air. The Value of Having Haters Is… Fundamentals of Storytelling for Copy Don’t Cater to the Casuals – Feed the Fiends Instead Inscrutability is Fascinating Even to People Who Don’t Know What It Means Guess What People Are Thinking, and They’ll Mistske You For Their Own Mind.